Peace through saffron. That’s the mission of Rumi Spice, partnering with Afghan farmers and uniting them with saffron buyers around the globe. Afghan saffron is some of the world’s best—distinct and delicious. The climate is perfect for growing the flowers, so this exotic spice has been a staple of Iberian, Northern African, and Middle Eastern cuisine for centuries. Surprisingly versatile, saffron is at turns earthy, bitter, and honey-like. Often called “red gold,” it’s the world’s most expensive spice because a single pound takes 100,000 flowers. The stigmas must be carefully handpicked early every morning. But even with such a lucrative crop, farmers in Afghanistan face perilous choices. The Taliban often lures them into growing poppy or opium plants by offering quick paydays. Four U.S. military vets saw a great opportunity for change. They founded Rumi to empower Afghan farmers while lessening terrorist influence. Rumi partners with farmers and gives them the needed support to grow sustainable, profitable crops. The Founders visit the farms regularly to understand production costs, and Rumi even reinvests at least 10% of profits back into needed infrastructure—including processing facilities, drying machines, and support during harvesting season. By connecting farmers directly with customers around the world, Rumi cuts out the middlemen and increases the farmer’s profits. The result is empowered, financially independent citizens. Meanwhile, you’ll be getting a fresh culinary treasure, some of the very best of its kind, right from the source. Unlock the flavors, aromas, and bright golden color of this saffron in a variety of meats and stews. A little goes a long way, with just a few strands unleashing all of the spice’s tones. You’ll taste the difference, and you’ll make a difference. Hello everyone! I'm proud to introduce Rumi Spice to The Grommet. I'd be happy to answer any questions you have! If there was one thing you want the average consumer to know about saffron, what is it? It is the spice you save for special occasions. If you have special people coming over and you want to wow them. It's a wonderful spice and there are a lot of fun, modern ways to be using it beyond the traditional dishes it's known for. Thanks, Kim! You can check out the rest of the interview with Rumi Spice below! @Kimberly I'd love to try some recipes. Can you suggest where to find them? Check us out on Pinterest, where you'll find a number of great recipes and interesting ways to use our saffron! Thank you for your support! how would you describe the flavor of saffron for those of us who are new to it? I know that's a tough one, describing a flavor. But does it have things like floral, fruity, hot, spicy, sour notes...? Love what you are doing. Your spice would make such a great client gift. It was an eye opener for me when I gave them regular gifts of floral or poinsettia etc.. and then changed to gifts that made a difference in the world. I was overwhelmed with thank you notes. It is definitely tough to describe flavors in general, but especially when it comes to saffron! It is such a unique spice that has its own delicate flavor and is unlike anything else I've ever tasted so making an easy comparison is nearly impossible. Our saffron has a slightly sweet taste, almost honey-like, but also contains a little hint of bitterness. It is very versatile spice that can be used in anything from beverages to sauces, entrees to desserts. 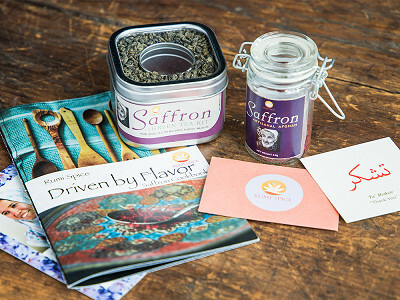 The only way to truly know what saffron tastes like is to try it for yourself! Just wanted to point out that Afghani is a currency. The people are referred to as Afghan. Thanks, Mike! We just made the fix! Enjoy all the saffron! Afghani can also refer to the language. @Jim Thanks for pointing this out. My daughter works with lots of folks from lots of different countries. Her boss (from China) had to point out to her one time that when talking about his people, they are referred to as Asian, furniture is Oriental! How long will the saffron stay fresh and potent? The larger size looks like a great buy but I don't want to wind up throwing it away. 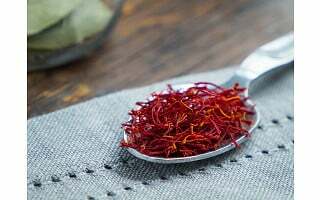 Saffron has a very long shelf life and will stay fresh for up to two years if it is kept in a cool, dry place and out of direct sunlight. Hope this helps! You refer to testing the saffron..is it tested for heavy metals and/or pesticides? Thanks for your question! 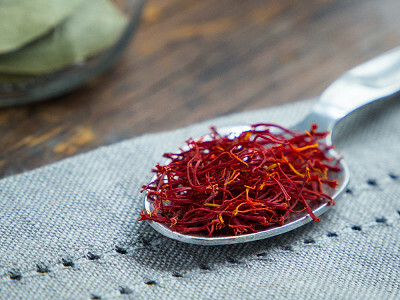 Currently, our saffron is tested for foreign matter, floral content, strength of Crocin, e. Coli, and salmonella in accordance with International Organization for Standardization (ISO) criteria. In addition, we work directly with our farmers, who are our business partners, as opposed to through middlemen. By doing this we ensure that no pesticides are used at any time by any of our farmers. We would also conduct any additional testing at the request of any of our buyers. I hope this answers your question! Thank you! that's great to know. 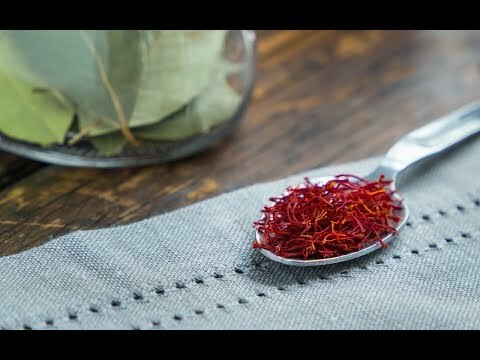 In addition to David's question about how long this saffron will hold its flavor and potency, I'm wondering if any recipes come with the product... Or if the cookbook is available for sale as a separate item? Or as a simple set - saffron w/cookbook? I can't wait to get this! I plan to share it with my "foodie" sister and brother-in-law! We do have a recipe booklet that we include in our ultimate gift box! We currently do not offer the recipe booklet for sale as a separate item, or as part of a smaller set, but may in the future! We also invite you to check us out on Pinterest, where you will find many more incredible recipes to try using our saffron. Thanks again for your support! I too am a military veteran, and I admire how you've used your experience. I'm excited to receive my spices and try out some of the recipes. I haven't cooked with saffron before but I love the flavor in foods from our local restaurants, and it will be fun getting started. Best of luck with your business, the Grommet is a fun place to shop, I love hearing from inventors and owners themselves. I hope you can bring more female veterans into your business as well...good luck with everything your trying to do! Thank you so much for your support! We always love to hear from fellow veterans, and we really hope you enjoy the saffron! Another question - Would refrigeration help to prolong shelf life? Great question. People tend to have different opinions on refrigerating saffron, but it is generally not recommended because saffron will begin to absorb moisture once it is exposed to room temperature. 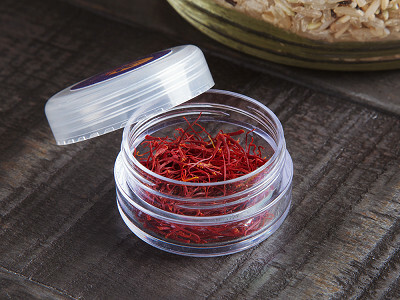 Keeping your saffron dry, cool, away from direct sunlight and in an airtight container is the best way to preserve saffron's shelf life. I'm confused. The 1 gram size says that it is .043 lb. The 2 gram size says that it is .262 lb. which is much more than twice is much. Is the .043 a misprint and should be .143? Hi Debra, thanks for the question. The weight refers to the product and the packaging. The 1 gram comes in a small plastic container while the 2 gram comes in a larger jar which is heavier. There is no misprint. 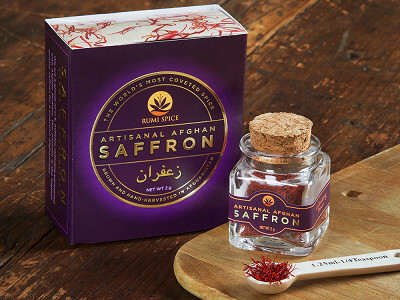 The difference in weight is due to the weight of the packaging for the two products, not the weight of the saffron itself. The 2 gram size comes in a glass bottle that is significantly heavier than the plastic containers we use for our 1 gram offering. Please check your description, Afghani is the currency, Afghan are the people! We are on top of it, Victoria, thanks for looking out! Saffron To see if saffron origin or price would make a difference in our cooking, we prepared three batches of risotto and compared Spanish, American, and Indian saffron. Tasters liked the expensive Indian saffron least, and the overwhelming favorite was American. Our takeaway? Just because saffron has an expensive pedigree doesn't mean it will taste good. Shop carefully, and if you come across domestic saffron, buy some. It can be an excellent—and relatively inexpensive—alternative. Thank you for your comment! This is a very interesting article to be sure. Our opinion is that saffron is different depending on its origin, and individuals from all over the world prefer saffron from different places, so there is no "right answer." It all comes down to personal preference in the end. Our mission at Rumi Spice is to give back to the people of Afghanistan in order to continue making a difference there, and it is a mission we believe in strongly, which makes us biased towards Afghan saffron! It is also worth noting that Afghan saffron has placed first at the International Taste Tests in Brussels for three years running! Good.we use lots in our receives .i would like to try. How long it can be effective?why the price is almost double than Indian stores? Our saffron will last for approximately two years if stored in a cool, dry place out of direct sunlight. The price reflects that we sell only the highest-quality Negin saffron tested in accordance with ISO standards, hand-picked by our partners in Afghanistan. Furthermore, it takes a lot of time, money, and labor to process, transport, and market our saffron in order to sell it here in the United States and Canada to distributors, wholesalers, retailers, and customers. I hope this answers your question and thank you so much for your support! Hi Steve glad to see you like the product. If you connect with our customer support team here, they can put you in touch with Kim! Steve, we would be honored to speaking to your listeners - what a wonderful opportunity. Thank you, and we look forward to connecting. Peace through saffron. That’s the mission of Rumi Spice, partnering with Afghan farmers and uniting them with saffron buyers around the globe. Afghan saffron is some of the world’s best—distinct and delicious. The climate is perfect for growing the flowers, so this exotic spice has been a staple of Iberian, Northern African, and Middle Eastern cuisine for centuries. Surprisingly versatile, saffron is at turns earthy, bitter, and honey-like. Often called “red gold,” it’s the world’s most expensive spice because a single pound takes 100,000 flowers. The stigmas must be carefully handpicked early every morning. But even with such a lucrative crop, farmers in Afghanistan face perilous choices. The Taliban often lures them into growing poppy or opium plants by offering quick paydays. Four U.S. military vets saw a great opportunity for change. They founded Rumi to empower Afghan farmers while lessening terrorist influence. Rumi partners with farmers and gives them the needed support to grow sustainable, profitable crops. The Founders visit the farms regularly to understand production costs, and Rumi even reinvests at least 10% of profits back into needed infrastructure—including processing facilities, drying machines, and support during harvesting season. By connecting farmers directly with customers around the world, Rumi cuts out the middlemen and increases the farmer’s profits. The result is empowered, financially independent citizens. Meanwhile, you’ll be getting a fresh culinary treasure, some of the very best of its kind, right from the source. Unlock the flavors, aromas, and bright golden color of this saffron in a variety of meats and stews. A little goes a long way, with just a few strands unleashing all of the spice’s tones.